Our Sweets and Confectionery department here at calendar Lady Promotions have a product for everyone's taste. Simply choose the Company Confectionery product that you'd like o give away as a promotional item and we'll see that they all get printed up with your business details and company logo. 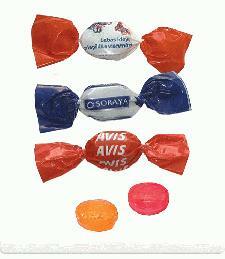 Other promotional and personalised items besides our Company Confectionery click here. View the full rage of Company Confectionery here. So for all your sweets and confectionery needs, visit our Personalised confectionary department. To find out more about our Company Confectionery click here and fill in the contact form and we'll get straight back to you.